We believe children can learn and experience God's love at all stages of their life. That's why we offer Sunday School classes for infants on up to 12th grade. We have many dedicated Sunday School teachers who have a heart for children. It is our goal to teach your child God's Word, apply it to their lives, encourage them to look up and memorize scripture, and connect with other people of the church of all ages. Click HERE to see descriptions of our Sunday School classes. Children's Bible Study is for all children in the 4th, 5th, and 6th grade. It is held every Wednesday during the school year and lasts from 6:45 - 7:45 p.m. in Room E202. Bring your Bible. Friends are welcome to come. Click HERE for next week's reading assignment. The Wednesday Night Bible Club is for children in Kindergarten - 3rd Grade. It will give the children a fun, hands-on way of experiencing Bible stories. It is held every Wednesday during the school year and lasts from 6:45 - 7:45 p.m. in Room E213. The Sprouts are our nursery kids that are 4 years old and under. Besides play time, they will have a Bible story and activity. It is held every Wednesday during the school year and lasts from 6:45 - 7:45 p.m. in Room E106. Confirmation is the yearlong process for 6th graders to become members of the church. On Confirmation Sunday, our Confirmands make their formal commitment to Christ. Confirmands learn about church history, the basics of Christianity, and history of Methodism. They also visit other denominations and do service projects. Confirmation meets at 10:00 a.m. on Sunday mornings in Room E212. Click HERE for our information packet. Pray & Play is our monthly program for children age 1 - 4 years old. We play in the gym or on the playground, have crafts, snacks, and a Bible story. Parents must stay. Pray & Play is usually the second Saturday of the month from 9:00 - 11:00 a.m. Family Night will take the place of Pray & Play in April. Come experience a Bible story with your family in a new way! Our Family Night events are designed to help parents lead their children in spiritual development. We meet for dinner at 5:30 p.m. in the Fellowship Hall. Families then read the Bible Story together and then go station to experience the Bible story in different ways. Click HERE for more information about our next Family Night. 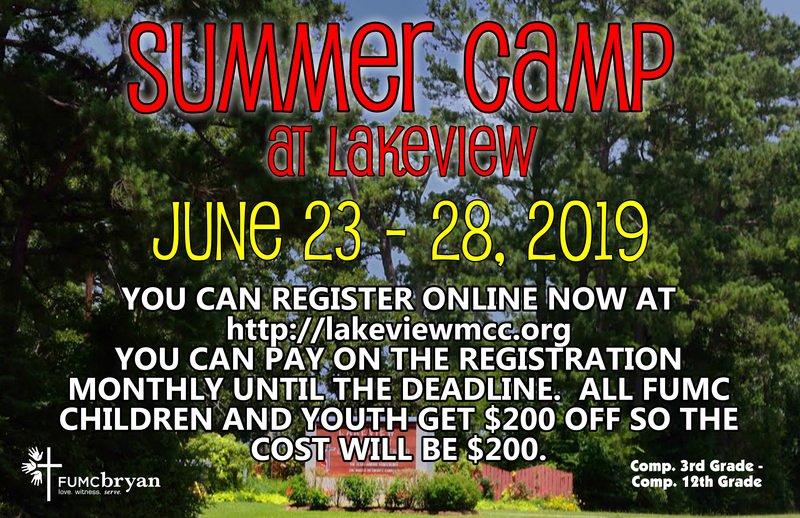 Summer Camp is for all children and youth who have completed 3rd grade - completed 12th grade. The dates for 2019 are June 23-28. Click HERE for more information. The annual Children’s Worship Festival will be Sunday, September 23rd at 11:00 a.m. in the Sanctuary. The service is entirely geared towards children. Dress comfortably and bring a friend! Children are invited to sit on the floor in the front of the sanctuary. We want children in worship! From infant on up, children are welcome in our worship services. Children learn to worship by watching their parents and grandparents. We understand that children may fidget and make noise from time to time. We know adults that do that too! We have a children's sermon at each service except on Communion Sunday. Worship activity books are available at each service. Child care is provided for all worship services and most of the weekly evening activities. We are proud to have a very caring child care staff. Contact Jeff Hobbs at Jeff@fumcbryan.org if you are interested in serving. All volunteers must go through Safe Sanctuary training. If you have any questions about any of our programs, contact the Director of Children's and Family Ministries Jeff Hobbs at Jeff@fumcbryan.org or 779-1324. Completed applications can be emailed to Jeff@fumcbryan.org or turned in at the church office.